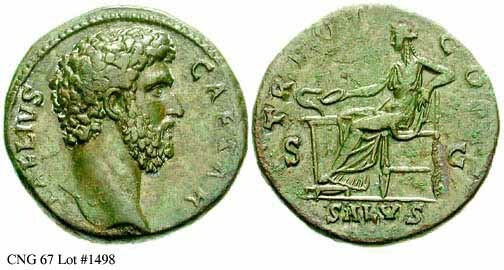 Caesar 136 - 137 Hadrian appointed Aelius as his Caesar to succeed him but died of illness shortly before his own death. 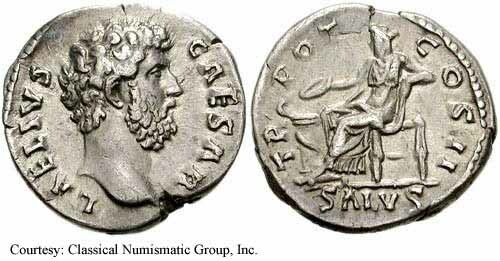 Aelius would probably have made a fine emperor as he was well liked by Roman citizens and was a capable military leader. 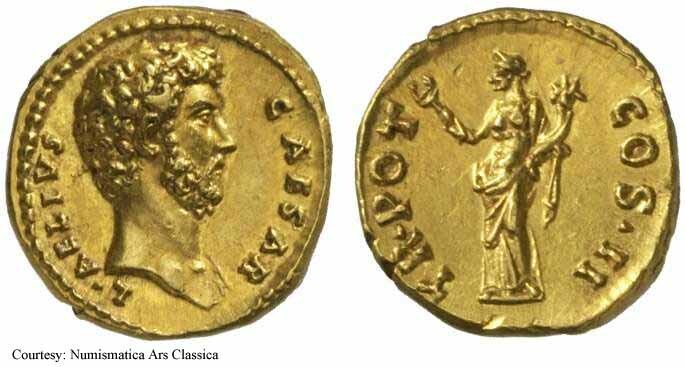 RIC 443 (Hadrian), BMC 999 (Hadrian), C 12 Aureus Obv: LAELIVSCAESAR - Bare head left. Rev: TRIBPOTCOSII Exe: CONCORD - Concordia seated left, holding patera. 137 (Rome). $15,500 1/13/03. RIC 444c (Hadrian), BMC 1004 (Hadrian), C 42 Aureus Obv: LAELIVSCAESAR - Bare head left. Rev: TRIBPOTCOSII - Pietas standing right, sacrificing over altar; PIE TAS across fields. 137 (Rome). $8,827 12/5/02. 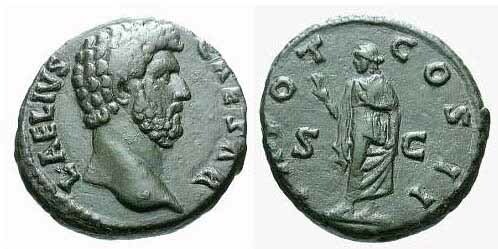 RIC 430 (Hadrian) Quinarius Obv: LAELIVSCAESAR - Bare head right. Rev: TRPOTCOSII - Felicitas standing left, holding cornucopia and caduceus. 137 (Rome). $37,344 12/5/02. 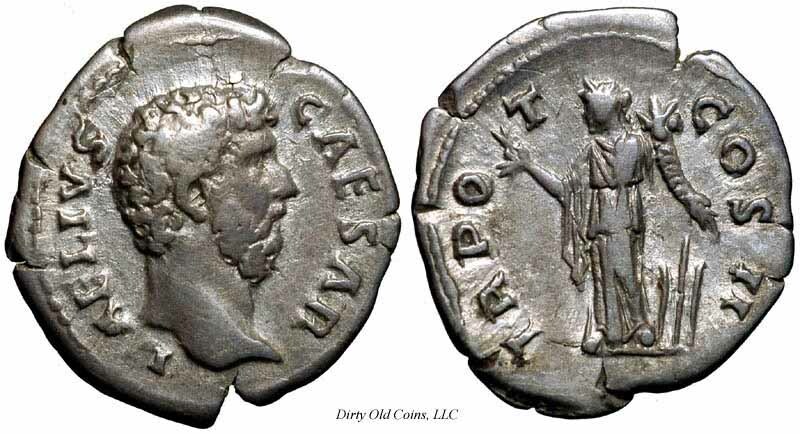 RIC 428 (Hadrian) Denarius Obv: LAELIVSCAESAR - Bare head right. Rev: CONCORDIA - Concordia standing left, holding patera and cornucopia. 137 (Rome). 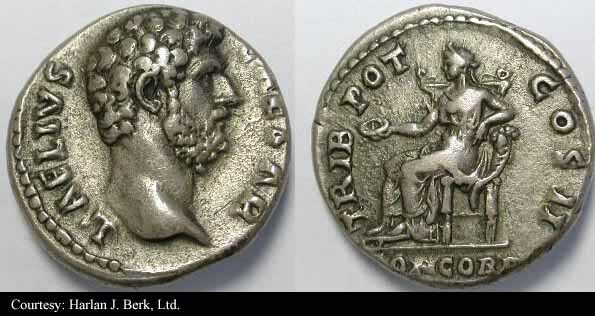 RIC 430 (Hadrian), C 50 Denarius Obv: LAELIVSCAESAR - Bare head right. Rev: TRPOTCOSII - Felicitas standing left, holding cornucopia and caduceus. 137 (Rome). RIC 431 (Hadrian), C 52 Denarius Obv: LAELIVSCAESAR - Bare head right. Rev: TRPOTCOSII - Fortuna standing left, holding flower and cornucopia; rudder to right. 137 (Rome). RIC 432 (Hadrian), C 53 Denarius Obv: LAELIVSCAESAR - Bare head right. Rev: TRPOTCOSII - Pietas standing left, sacrificing over altar. 137 (Rome). RIC 435 (Hadrian), BMC 979 Denarius Obv: LAELIVSCAESAR - Bare head right. Rev: TRPOTCOSII - Spes standing left, holding flower and raising skirt. 137 (Rome). RIC 436 (Hadrian), S 3967 Denarius Obv: LAELIVSCAESAR - Bare head right. Rev: TRPOTCOSII Exe: CONCORD - Concordia seated left, holding patera. 137 (Rome). 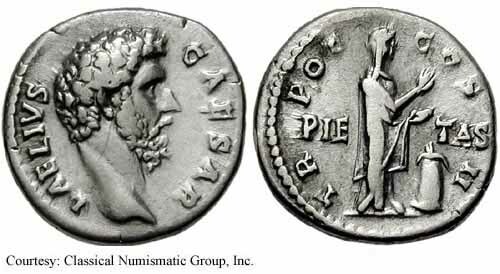 RIC 437 (Hadrian) Denarius Obv: LAELIVSCAESAR - Bare head right. Rev: TRPOTCOSII Exe: CONCORD - Concordia seated left, holding patera. RIC 439 (Hadrian) Denarius Obv: LAELIVSCAESAR - Bare head right. Rev: TRPOTCOSII - Pietas standing right, holding patera; PIE TAS across fields. $445 5/21/03. RIC 440 (Hadrian), BMC 994, C 43 Denarius Obv: LAELIVSCAESAR - Bare head right. Rev: TRPOTCOSII Exe: SALVS - Salus seated left, feeding snake on altar. 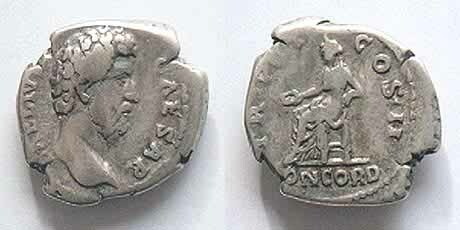 RIC 443v (Hadrian), BMC 1001 Denarius Obv: LAELIVSCAESAR - Bare head right. Rev: TRIBPOTCOSII Exe: CONCORD - Concordia seated left, holding patera. [Known to RIC only in Aureus]. 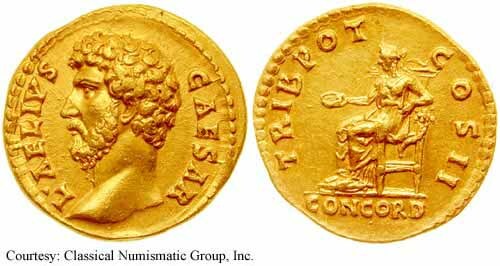 136-137 (Rome). 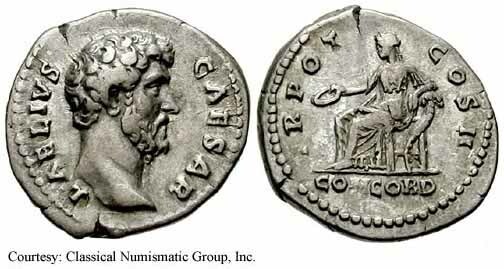 RIC 1055 (Hadrian), BMC 1914 (Hadrian), C 56 Sestertius Obv: LAELIVSCAESAR - Bare head right. Rev: TRPOTCOSII - Spes standing left, holding flower and raising skirt. c.137 (Rome). 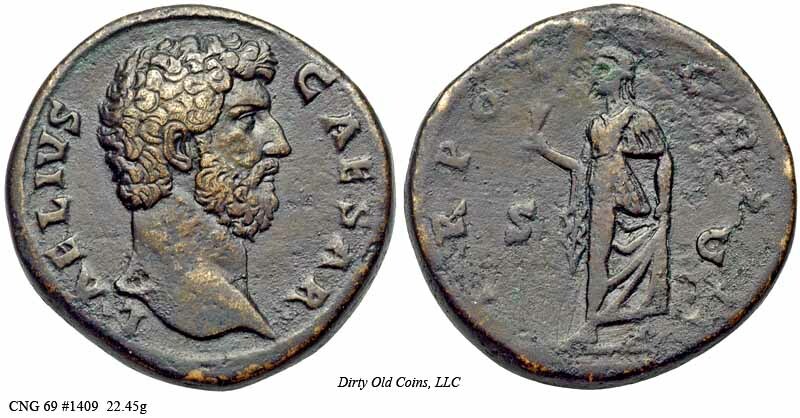 RIC 1063 (Hadrian), C 44 Sestertius Obv: LAELIVSCAESAR - Bare head right. RIC 1065 (Hadrian) Dupondius Obv: LAELIVSCAESAR - Bare head right. Rev: TRPOTCOSII - Fortuna standing, facing, holding flower and cornucopia with rudder on globe. c.137 (Rome). 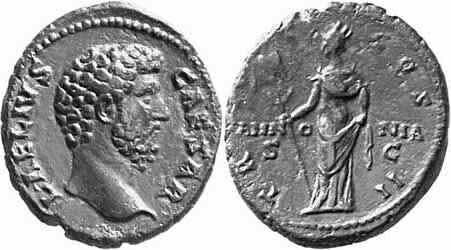 RIC 1067 (Hadrian), C 59 As Obv: LAELIVSCAESAR - Bare-headed, draped bust right. Rev: TRPOTCOSII - Spes advancing left, holding flower and raising skirt. $310 2/17/05. 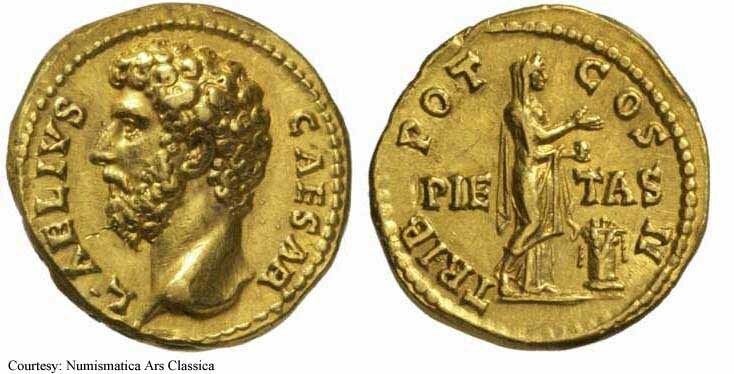 RIC 1071 (Hadrian), S 1217 As Obv: LAELIVSCAESAR - Bare head right. Rev: TRPOTCOSII - Pannonia standing left, holding vexillum and raising skirt; PANNO NIA across field.